Carbon Tetrabromide, also known as Tetrabromomethane, is a kind of carbon bromide. Both the names are accepted by the IUCN depending on whether it is considered to be an organic or inorganic compound. This chemical compound is used for different purposes in various industries. It can also be prepared in a more economic way using tetrachloromethane with aluminum bromide. This reaction takes place in 100 °C temperature. The molecular formula for Carbon Tetrabromide is CBr4. 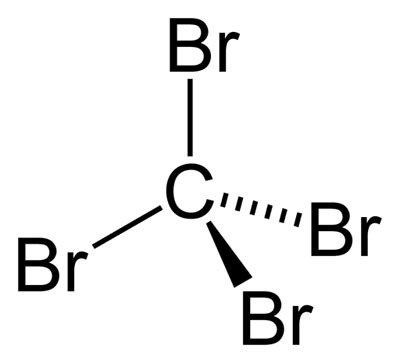 Appearance: This compound has a colorless crystalline appearance. Odor: It has a slight distinctive odor. Density: It has a density of 3.42 g /cm3 in its solid state. Liquid Carbon Tetrabromide has a density of 2.961 g/cm3 at 100 °C temperature. Molar Mass: The molar mass of this compound is 331.63 g /mol. Melting Point: The melting point of this material is 91.0 °C. Boiling Point: Its boiling point is 189.5 °C. Vapor Pressure: It has a vapor pressure of 5.33 kPa at 96.3 °C temperature. This crystalline compound has a monoclinic crystal structure. The molecules of Carbon Tetrabromide are tetrahedral. It means the atoms are arranged in a tetrahedral manner inside each molecule of this compound. The high temperature alpha (α) phase of the Carbon Tetrabromide molecules is called a plastic crystal phase. These molecules are positioned on the corners as well as the center of the faces of the cubic unit cell in an fcc arrangement. Earlier it was believed that the molecules of this compound were able to rotate almost freely (a ‘rotor phase’), which could make them look like spheres after an average time. However, resent studies show them to be restricted to 6 possible orientations (Frankel disorder). In addition, these molecular orientations do not occur entirely independently. Sometimes the bromine atoms of different neighboring molecules come very close to each other leaving little space for independent orientation. This prevents certain orientational combinations between two neighboring molecules. These problems cause significant amounts of disorder inside the crystals of this carbon bromide compound leading to high-structured sheets of diffuse intensity in X ray diffraction. The defense intensity structure provides detailed information about this structure. This crystalline compound is used in the Appel reaction along with triphenylphosphine. Appel reaction is an organic reaction in which alcohols are converted to alkyl bromides. Carbon Tetrabromide is used for this purpose as it shows much less stability than lighter tetrahalomethanes. It is commonly used as a solvent for waxes, greases and oils. Carbon Tetrabromide is applied for the purpose of blowing and vulcanization in rubber and plastic industries. This compound is used as a polymerizing agent. It also has intermediate applications in agrochemical manufacturing. It is used as sedative. This non-flammable material is often used for producing fire resistant chemicals and various photochemical compounds. 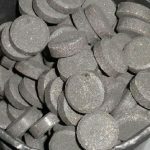 Due to its high density, it is used for separating different minerals. This crystalline compound can cause serious health hazards in case of over exposure. It is important to take proper precautions while handling this material. This substance can have hazardous health effects in case of eye contact, inhalation and ingestion. It can also cause skin irritation if comes to direct contact. This material can be toxic to different human organs such as lungs, kidney, liver and upper respiratory tract. Eye Contact: In case of direct eye contact, one should immediately remove any contact lenses. It is important to flush the eyes with plenty of lukewarm water at least for 15 minutes. Immediate medical assistance is required. Skin Contact: The victim should wash the affected skin area with a disinfectant soap and plenty of water. Applying an Emollient can help in reducing the irritation. One should get medical assistance if the irritation persists. Inhalation: The victim should be removed to fresh air. One should loosen any tight clothing such as collar, belt and tie. Oxygen or artificial respiration should be provided if the victim is experiencing breathing difficulty. Performing mouth-to-mouth resuscitation can be hazardous for the person providing the aid. Immediate medical attention is required. Ingestion: It is not advisable to induce vomiting in case of accidental ingestion of this material. Tight clothing should be removed. One should never give anything by mouth if the victim is unconscious. It is important to obtain medical aid as soon as possible in case large amounts of this material have been ingested. NIOSH approved dust respirator, lab coats, safety goggles and protective gloves should be used for proper personal protection. Carbon Tetrabromide is a non-flammable substance. However, the containers storing this substance may explode when comes to contact with heat. Due to this reason, fire fighters should use proper fire fighting gear and protective clothing when extinguishing a fire around it. One can use a shovel to clean this material in case of large spillage. Proper waste disposal containers should be used for disposing of the spilled material. It should be stored in tightly sealed containers in a cool and well ventilated area. This colorless crystalline compound is available in various purity grades. Numerous companies around the world supply this material. The price for 100 gm of this material ranges between $130 and $ 160 depending on the quality of the product. Carbon Tetrabromide is one of the most useful carbon bromides with various industrial applications. The relatively simple production method is one of the main reasons for its wide industrial uses.